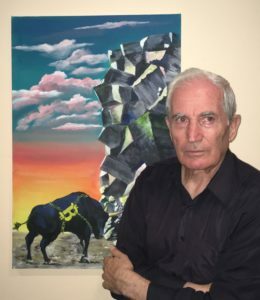 Ludvig Manukyan is a painter, sculptor, and illustrator who has taken a strong interest in Bitcoin and cryptocurrencies. Ludvig began painting Bitcoin-inspired art themes in 2017. Through allegories and symbolism, Ludvig aims to depict and capture the political, economic, and sociocultural changes in the ongoing Bitcoin revolution in his Bitcoin Collection. Ludvig Manukyan was born to Aghas Manukyan, a decorated WW2 veteran and paratrooper in the Soviet army, and Asya Sarkisyan on April 4, 1949 in Leninakan, Armenian SSR. As the 2nd eldest of 4 siblings, Ludvig began supporting his family from a young age as much of the country and economy was left in ruins post-WW2. Ludvig quickly showed artistic ability as a child, and was enrolled in the Sergey Merkurov School of Fine Arts in his hometown of Leninakan in 1959. Ludvig attended the famous art school for 4 years, until 1963, where he further developed his technical art skill and was introduced to painting and sculpting. After art school, Ludvig immediately applied his newfound sculpting skills to woodworking and began building fine chess and backgammon sets with his brothers which they would proceed to illegally sell on the second market. Due to strict trade restrictions, they were forced to put a halt to their operations. At the age of 18, Ludvig relocated to Yerevan, the country’s capital, after being admitted to the Yerevan Polytechnic Institute in 1967. Ludvig graduated from the university in 1976 with master’s degrees in electrical and thermal power engineering. Ludvig went onto work at the Yerevan Thermal Power Plant as a thermal and heat engineer. In the 1980’s, the Soviet Union introduced the glasnost and perestroika policies and the country went into political turmoil and impending economic collapse. During these harsh times, Ludvig began participating in Armenian independence parties and movement. He used his artwork to raise awareness and advocate for democracy and independence. His work was cut short in 1988, when an earthquake left his hometown of Leninakan in total devastation. Ludvig immediately returned home to help in relief and restoration efforts. Ludvig was married to Gayane Ormandzhyan in Yerevan in 1989, he and his wife had their their first son in 1990. The new family was granted asylum in the United States and they immigrated in 1991 during the official collapse of the union. In their new country, Ludvig took on many different jobs over the years to support his family and vigorously continued painting which would be showcased and sold in local Armenian art and bookstores. Ludvig also enrolled in evening courses at a local community college to learn English. Ludvig first discovered Bitcoin in 2013 after being introduced to it by his son. The two have shared many long chats about the technical and economic aspects of the new technology. In 2017, Ludvig picked up his brush for the first time in close to 10 years and released his first Bitcoin painting, The Bitcoin Bull. Ludvig is currently seeking retirement to settle down and focus on his artworks. Ludvig enjoys reading, watching old American western and Soviet films, and taking long walks. His interests consist of art, mathematics, physics and economics. Ludvig is a strong supporter of open societies. Ludvig enjoys long chats with his son on various topics which include technology, open-source software, physics, politics, history and Bitcoin. Ludvig has restarted painting after discovering Bitcoin.